About a month ago I blogged about Installing SOLR 7.2.1 (on prem) for Sitecore 9.1. That post used the JAVA runtime (JRE) to be installed. 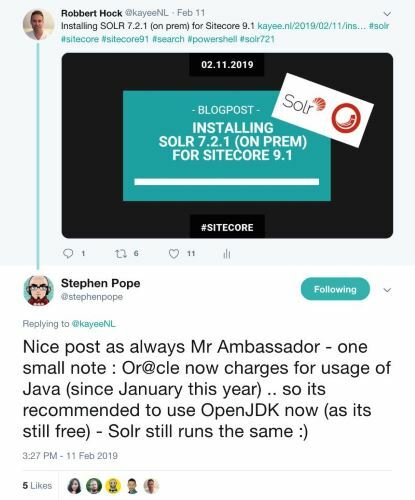 When I tweeted about my blogpost (to get a little bit of attention and sharing it with the community ;-), Sitecore Architect Stephen Pope responded in the following manner (see image). I already knew that Oracle recently announced a change in their licensing, starting January 2019, which affects the use of Java in specific scenarios. You can also read more about it here: Oracle Will Charge for Java Starting in 2019. 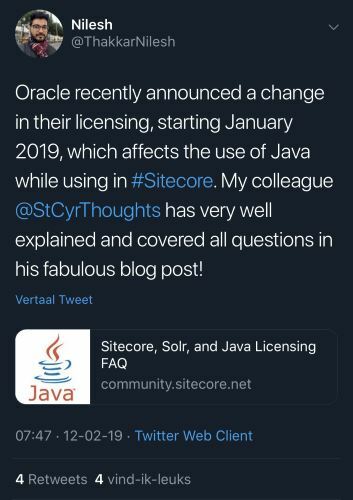 Sitecore itself actually wrote a FAQ post on it: Sitecore, Solr, and Java Licensing FAQ. In that post one of the proposed options is to “Migrate to the open source (OpenJDK) version of Java”. 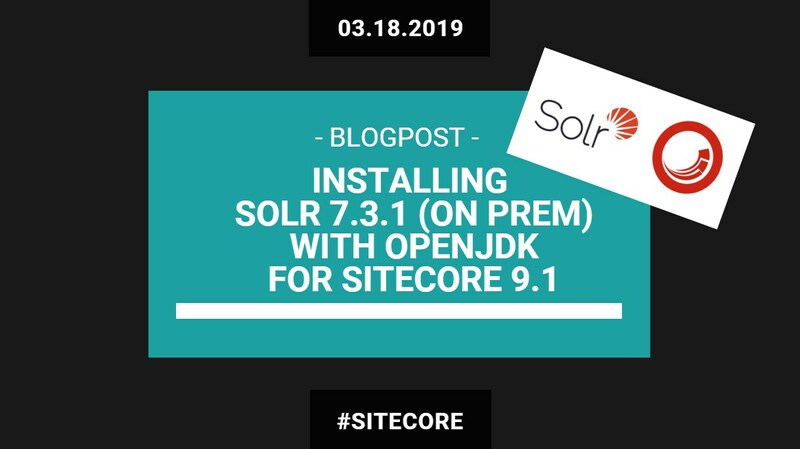 In this post I would like to walk you through the process I went through in order to install SOLR 7.3.1 (even though 7.2.1 is needed for installing Sitecore 9.1, I found out that in combination with OpenJDK we actually need 7.3.1). In the end it’s basically not changing very much compared to the previous blogpost, only some slight changes in the pre-requisites and the final Powershell script. So let’s go! So what I started with was to get OpenJDK installed, and then have that working with the recommend version for Sitecore 9.1: SOLR 7.2.1. So we first need to make sure that we have the OpenJDK installed. OpenJDK (Open Java Development Kit) is a free and open-source implementation of the Java platform. As said in my previous blogpost, I’m using Chocolatey as my software automation tool. This will make sure that the latest version of the OpenJDK gets installed onto your local machine. The JAVA_HOME path variable gets added with a path of: C:\Program Files\OpenJDK\jdk-11.0.2. So instead of having $JREVersion = “1.8.0_201”, we now adjust that to $OpenJDKVersion = “11.0.2”. And instead of having $JREPath = “C:\Program Files\Java\jre$JREVersion”, we now adjust that to $JREPath = “C:\Program Files\OpenJDK\jdk-$OpenJDKVersion”. But apparently that was not it entirely. When I ran the adjusted script I found out that the script was failing when the automatic script wants to start the SOLR service automatically for you and fire it up. So here’s where all the troubles started and where I ran into problems. Apparently when we run: solr.cmd start, the batch file checks for a specific major JAVA version and it throws the following error and it won’t start the service. As Johannes Zijlstra already said in one of his blog-posts: Sooo… Yeah. Clearly 1.8 is way higher than 10.0.1. Makes sense. (In my case 11.0.2 ;-)). Apparently what solr.cmd start (for version 7.2.1 and below) does is a check if the Java Major Version is at least version 8, it our case with OpenJDK 12.0.2, it results into zero (0), which is less than 8 of course. When commenting out that ‘UseParNewGC’ in the solr.cmd script I ran into the following Unrecognized VM option ‘PrintHeapAtGC’. From there it was VM option after VM option message. 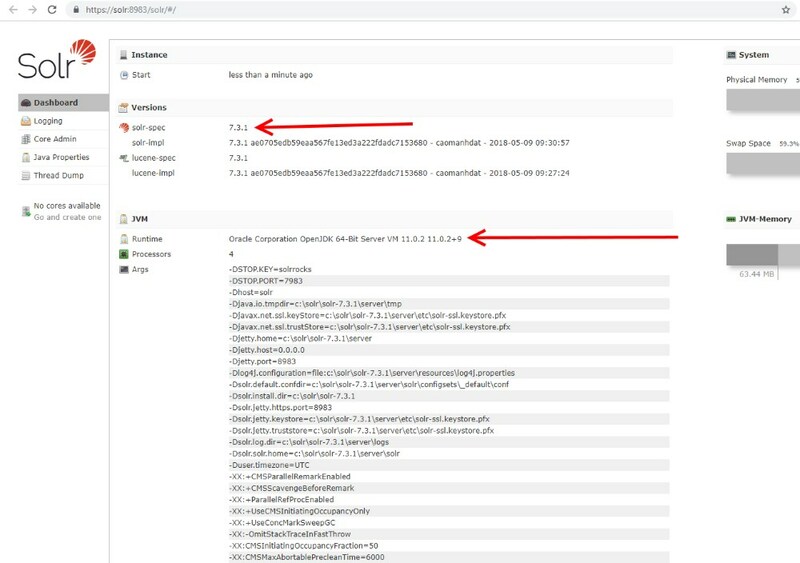 Java 10 is in process of being verified to work with Solr, see this JIRA in the 7.3.1 release notes: SOLR-12141: Fix “bin/solr” shell scripts (Windows/Linux/Mac) to correctly detect major Java version and use numerical version comparison to enforce minimum requirements. From there it pointed me to have a look at SOLR 7.3.1 in combination with OpenJDK, so I fixed the SOLR version in the Install-Solr-OpenJDK.ps1 script from 7.2.1 to 7.3.1, and that did the trick for me.